Vietnam is ready to host the Asia-Pacific Economic Cooperation (APEC) Year 2017 with all preparations being basically completed on schedule, Deputy Foreign Minister Bui Thanh Son said in an interview to the press. Son, who is also Vice Chairman of the National Committee on APEC 2017 and Chair of the Senior Officials’ Meeting (SOM) APEC 2017, said after nearly two decades of joining the APEC Forum, this is the second time Vietnam has been assigned to host the event, reflecting the international community’s trust in the country. Close to 200 activities of different scales focusing on the theme “Creating a new driving force for a common future” will take place across 10 cities and provinces from the north to the south during this year, with the most important event – the APEC High-level Week – to be held in the central coastal city of Da Nang in November, he noted. The National Committee on APEC 2017 was established in July 2015 under the chair of Deputy Prime Minister, Foreign Minister Pham Binh Minh and the involvement of 24 ministries, agencies and localities, he added. The establishment of five sub-committees in charge of contents, facilities and logistics, security and health, communication and culture, and reception is essential to ensuring the overall coordination of all preparatory steps, Son said. Vietnam has soon completed long-term oriented documents for preparing the event from selecting locations to host the APEC High-level Week and other main activities this year, as well as proposing the theme and priorities for the function. Son also highlighted challenges in the APEC Year 2017 amid regional and global complicated and unpredictable developments. 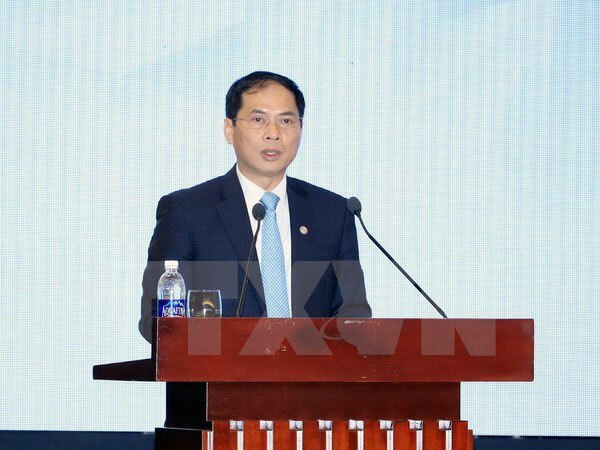 According to the Deputy Foreign Minister, the biggest obstacle for APEC member nations in general and Vietnam in particular is how to maintain the APEC Forum’s role as a leading economic connectivity and cooperation mechanism in the region to fuel the growth and prosperity in the Asia-Pacific. However, the above-said situation will also open up new opportunities for cooperation among the forum member economies, Son said, noting that the demand for cooperation and connectivity between regions and between Asian-Pacific countries is increasing as the regional and world peaceful environment and development are being threatened. After nearly three decades of development, the number of APEC committees and working groups has increased by three folds to about 50, covering various fields, from economic affairs, trade, sustainable development, narrowing development gap, and food and energy security. The Asia-Pacific has remained a leading region in terms of dynamic development with many member economies playing a key role in boosting global economic growth and connectivity, Son said. With the engagement in such large-scale free trade agreements as the Trans-Pacific Partnership (TPP), Regional Comprehensive Economic Partnership (RCEP), and Free Trade Agreement (FTA) with the Eurasian Economic Union, Vietnam has become an important link in an extensive economic connectivity network of 59 partners, including 18 APEC members, he added./.